The Gunnison Sage-Grouse is one of the rarest birds in the United States. 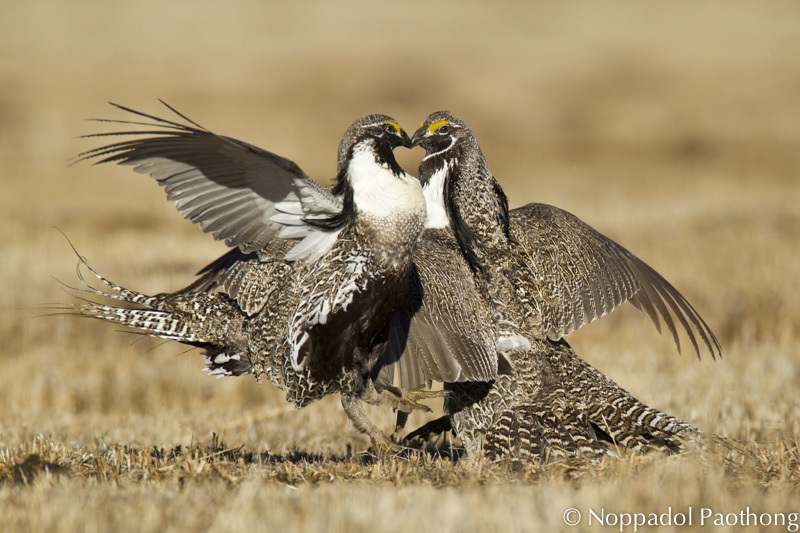 It was only recently acknowledged as its own species, separate from the Greater Sage-Grouse. In November 2014, it was listed as "threatened" under the federal Endangered Species Act. The striking males are consummate performers and can be found displaying on sagebrush plains in southeastern Utah and southwestern Colorado. Males gather and strut, hoping to impress females by fanning their long, spiky tail feathers. The rubbery sounds they make in display will surprise you! Females mate with the most impressive males. Political and legal wrangling are bound to follow the Sage-Grouse's listing as threatened. But experience shows that in the long term, this new level of protection could enable the population to recover, if it's coupled with cooperation among competing interests. Bird sounds provided by The Macaulay Library of Natural Sounds at the Cornell Lab of Ornithology, Ithaca, New York. Male Gunnison Sage-Grouse display sounds  recorded by Gerrit Vyn.